Recording songwriters, rejoice! The April issue of RECORDING offers cool tools and easy-to-use tips to help you turn your ideas into fully realized tracks and songs. Welcome the Spring with a whole slate of brand-new capabilities—we show you how! 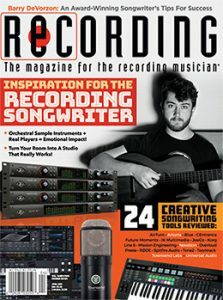 We also have an interview with Grammy winner Barry DeVorzon, helping songwriters achieve excellence in their craft. As always, our Songwriter Special features a huge grab-bag of reviews… because let’s face it, what doesn’t a recording songwriter need? We’ll let you check under the hood of songwriter-friendly recording gear and software like the CEntrance R4 portable interface, the RØDEcaster Pro system from RØDE, JoeCo’s Cello high-definition recording interface, and a variety of software from Arturia, Spitfire Audio, Toontrack, Tone2, and Overloud, as well as iOS apps and hardware from AirTurn, Future Moments, IK Multimedia, and Korg. Beyond the songwriting rig, we have in-depth reviews of Universal Audio’s powerful new Apollo X interfaces, new mic models for the Townsend Labs Sphere, and hot new gear from Line 6. All this plus Studio 101 with Darwin Grosse [READ HERE], Readers’ Tracks with Marty Peters, our regular monthly features, and more. Don’t miss out on this great issue and all it has to offer!